It's official! This May, I am thrilled to be traveling to Braga, Portugal as a member of a Habitat Global Village Team sponsored by Rotary Club-Champs Elysées and sent from the American Church of Paris! This is an opportunity first discussed last fall while at an American Church of Paris event, and I am so thankful to now see it come to fruition! While in Portugal, we will be building houses and hope alongside people in need of decent, affordable housing. From South Dakota to the Bahamas, mission/work trips have been some of my most profound memories in my life. I am looking forward for this opportunity to again experience another culture and share good energy and love. In order to travel, we are beginning the long process of fundraising. 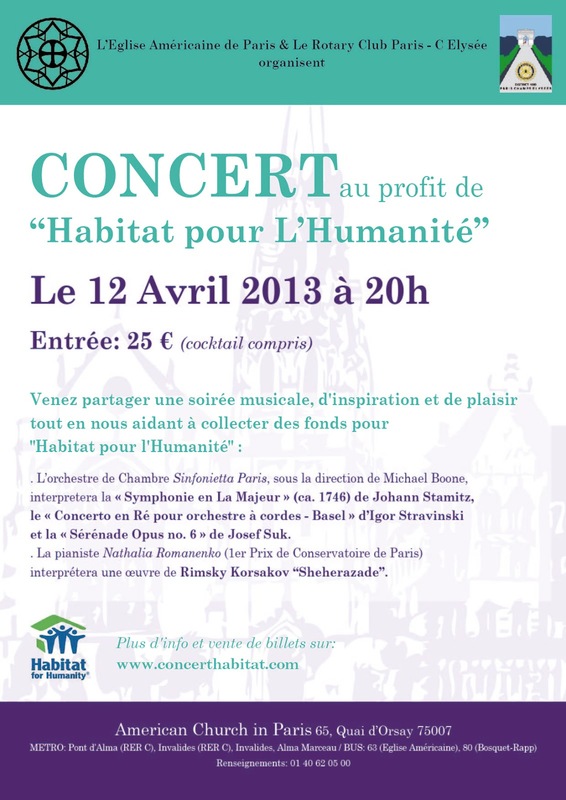 Easter bake sales, after church bake sales, and, most importantly (read: lucratively, ha), a huge concert on April 12th at the American Church in Paris, complete with great musicians and an orchestra brought in by the Rotary Club-Champs Elysées. 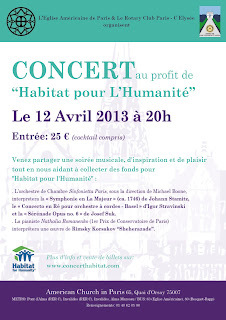 (See flyer below) If you are in the Paris area, or will be April 12th-- SEE ME FOR TICKETS! Check out this link below to learn more about my trip, Habitat's work and how you can help us get there. Any and all mental/emotional/physical/financial advice or assistance you can provide will be well-received with a thankful heart.